This video was filmed at a PGC/Glazier Basketball Clinic. The Coach in the video is Arkansas Women’s Head Coach Mike Neighbors. 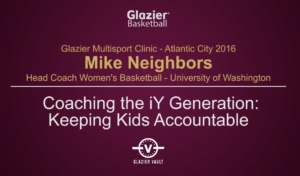 This video was filmed at the PGC/Glazier Spring 2016 Chicago Clinic and at that time he was the Head Women’s Coach at Washington. Coach Neighbors led the Huskies to the 2016 Final Four and has had them ranked in the top 10 for 2016-17 season. He is absolutely one of the best coaches at any level to study and learn from if you want to become a better coach. Even though it looks like nothing is there, the video will play once you click on it. It is a little over 10 minutes long and is very good.